Primary day in New York City is September 10, less than two weeks from now. Candidates in both the Republican and Democratic races have been to several forums and debates, and have several opportunities to lay out their agendas for the first term to follow three-term Mayor Michael Bloomberg. The New York Times recently provided a forum for New Yorkers to ask candidates some questions (some answers, including Joseph Lhota’s apparent unawareness of what social science research is, are worth perusing). Below, please find more questions about sustainability issues facing New Yorkers, questions which (if answered candidly) would allow voters to understand what choices exist prior to September 10. While certain candidates have platforms on safe housing issues, we see few details about the current land use and zoning procedures in place in New York City. Recently, these policies (as depicted in Kelly Anderson’s documentary My Brooklyn) have been linked to the destruction of community fabric in Brooklyn as high-rise condominiums and big box commercial developments replace working-class businesses and housing. What steps (if any) will the candidates take to ensure existing communities are not destroyed and that affordable housing is readily available for working-class New Yorkers? 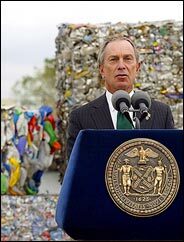 While candidates mention expanding recycling services, we have not heard discussions about continuing Mayor Bloomberg’s pilot program for composting food. Large-scale composting infrastructure might allow diversion of this share of the waste stream (between 20 and 30 percent of total) as well as allow composting of biodegradable packaging, which may allow manufacturers and distributors to provide effective design for composting in their packing material choices. Beyond the existing pilot program, what specific steps do the candidates propose to expand composting? What timetable can New Yorkers expect for these composting services? Continuing on the question of reducing local solid waste streams, thousands of plastic bags are distributed at local stores every day. These plastic bags are difficult to recycle because they jam processing equipment and they are light enough to fly out of trash cans and garbage trucks. From there, they produce visible blight in trees and threats to wildlife in our waterways. Several other communities have policies in place to limit or even eliminate plastic bags. Washington D.C., for example, has a small fee for each distributed bag. San Francisco has outright banned plastic bags in favor of paper or reusable canvas bags. Both policies have demonstrated effects at reducing plastic bags in their respective waste streams. Do the candidates support policy measures to limit plastic bag distribution, such as taxes or outright bans? Last year, the current administration proposed developing waste-to-energy programs in the city despite a long track record of public opposition to incineration. What positions do the candidates have on WTE plants? Have they discussed the costs of maintaining and operating the plants, or the potential emissions? Finally, it is encouraging that the CitiBike program has gotten off to such a strong start this year, and that New York City has a wide network of bicycle lanes. These developments are crucial elements of the PlaNYC platform on transportation. (Link opens a PDF.) That said, rare are the lanes that are not regularly abused by trucks and automobiles double-parking. Recently, the New York Times profiled where the candidates stand on some transportation issues, including the future of the bike lanes. It would be good for followup questions to ask how the candidates plan to instruct the police to enforce the integrity of the bike lanes. These are some of the important questions facing New York City. I hope the many politicians seeking to become the next mayor choose to address them in the days ahead so that the citizenry may make the best informed decision about the future of the city. This entry was posted in policy, sustainability on August 30, 2013 by Carl Zimring. FYI, you have a pro-fracking ad being hosted on your website. I’m not sure everyone sees this, but just thought I would let you know! Thanks — ah, the irony!